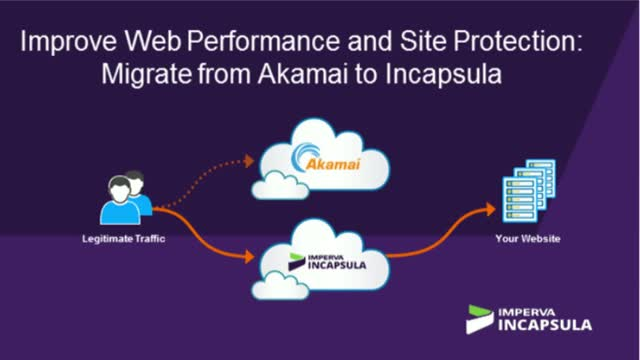 If your Akamai cloud-based platform is no longer meeting your company’s need for security and application delivery, consider a switch to Imperva Incapsula. The Incapsula cloud service helps you deliver applications securely and efficiently. With a single interface that integrates content delivery, website security, DDoS protection, and load balancing, you can accelerate the delivery of your web content and protect your site from external threats. And just for attending this live webinar, you’ll get a free migration guide to help you transition easily from Akamai to Incapsula. With PCI compliance, a robust engine with customizable security rule setting, 24/7 support, and significant cost savings, why wouldn’t you consider a switch to Incapsula? Find out if the Incapsula cloud security platform is right for you. With exponential growth of security data, do you know what security approaches your peers are taking? You know the threat landscape is constantly evolving, but do you know how your current cyber security defensive posture stacks up against those of your peers? In this live webinar, CyberEdge and Imperva will discuss the challenge and solution for the security data avalanche, the extent of cyber-security solutions deployed, and other key insights from the 2019 Cyberthreat Defense Report. -Do we have gaps in our cyberthreat de­fenses? -How are my peers thinking differently about cyberthreats and the options for defending against them? -How does our security spend compare to other organizations? -Which security technologies should we be investing in next? Amy DeMartine: Principal Analyst, Forrester. Terry Ray, SVP & Fellow, Imperva. Kunal Anand, CTO, Imperva. - A combination of defenses at the edge, in the network and inside the applications themselves make all the difference. - Full, real-time visibility with analytics help beleaguered security analysts quickly distinguish real threats from noise. - A consumption model allows the enterprise to quickly, easily and cost-effectively move protections to where they will do the most good. Plus more insights from industry veterans that will help you vastly improve application security, remediation, and deploy a DevSecOps model that works. Terry Ray has global responsibility for Imperva’s technology strategy. He was the first U.S.-based Imperva employee and has been with the company for 14 years. He works with organizations around the world to help them discover and protect sensitive data, minimize risk for regulatory governance, set data security strategy and implement best practices. Are you relying on manual DDoS mitigation methods? How can waiting minutes to mitigate a DDoS attack impact your business? Watch as Andy Shoemaker, founder of DDoS testing company NimbusDDOS, gives you a look behind the curtains of a live DDoS attack. Then see first-hand how Imperva Incapsula automatically blocks the threat without impacting the user experience. The exponential growth of users, apps, and data has led to an increase in legitimate data access, complicating the task of determining whether data access is appropriate. Traditional security approaches tend to lock things down and limit data usage by deploying broad sets of security policies. Companies that take this approach, however, are still suffering from data breaches. In the meantime, security teams are often overwhelmed with a significant amount of alerts that don’t provide actionable insights. Join to better understand key requirements needed in a web application firewall to protect applications and critical data in this changing world of application development and security. Attackers will continue to attempt to breach and steal sensitive data from organizations. Our goal is to detect those potential breaches as early as possible, before any actual harm is done. There are some early signs of data breaches. By detecting them, we can stop attackers before they find their way in. Imperva CounterBreach analyzes both user behavior and data access activity to identify suspicious user access. By adopting the concept of breach kill chain and the defense-in-depth security approach, Imperva allows you to detect threats in all stages of a data breach. As the web application landscape changes, so do the threats, as well as the tools used for application security and critical data protection. Learn about our analysis of key insights from the new 2018 Gartner Magic Quadrant for Web Application Firewalls to understand the latest WAF technologies, trends, and industry challenges. Hear the experiences of Imperva customers and how they implement web application firewalls to protect their enterprises. With the escalating threat landscape and the exponential growth of data and users, it’s no longer about whether you’ll get breached; it’s about when. The ideal situation would be to detect a data breach at an early stage. The reason why early breach detection is more practical is that often times bad actors are already inside the organization, abusing legitimate permissions to access sensitive data. To quickly detect a potential data breach, we need to be able to identify “early signs” of a breach. Data breaches are difficult to detect because security team is often drowning in alerts. Imperva CounterBreach uses machine learning and analytics to identify suspicious data access and prioritize threats. By distilling millions of alerts, Imperva allows you to focus on high-risk incidents. In this video, Senior Security Engineer Jonathan Gruber demos Imperva’s enhanced infrastructure DDoS protection analytics. The new dashboard shows details such as top traffic patterns by source, destination IP, port or packet size for a protected network. This video provides an overview of Imperva solutions for database compliance and security. Imperva Data Activity Monitoring (DAM) and Database Firewall solutions help organizations meet data compliance requirements for SOX, GDPR, HIPAA, PCI and many more, and protect enterprise data from both internal and external threats. What is DevOps, and what does it mean for security? In this session, we’ll talk about trends driving adoption of DevOps, and what are the security challenges posed by automated, API-driven frameworks, pros and cons of RASP, and the benefits of cloud WAF. We’ll then jump into a demonstration of how Imperva SecureSphere can be leveraged in a DevOps environment with Cloudentity to provide state of the art protections against application attacks. A massive overload of security events. Combine these three facts, and you get cumbersome and complicated security-related investigations. Find out how Attack Analytics (a new solution from Imperva) addresses all of the above. Now, more than ever, cryptocurrency exchanges are facing security threats in the form of volumetric, application layer, DDoS, and account takeover (ATO) attacks. Although the success of cryptocurrency exchanges makes them especially attractive to cybercriminals, attacks of late are taking exchanges by surprise, and they are often not scaled or have not built a secure environment. In this webinar, join Security Engineer Jonathan Gruber and Enterprise Security Expert Tal Stern from Imperva as they explore the latest cryptocurrency exchange vulnerabilities and attacks and explain the best strategies for mitigation. With the deadline for General Data Protection Regulation (GDPR) compliance passing on May 25, 2018, those companies that have taken the necessary steps are wondering “what’s now?”, while those lagging behind must quickly mobilize to eliminate gaps and mitigate the risks associated with failure to comply. - A refresh of the GDPR requirements and risks associated with the failure to comply. - An overview of the key actions and requirements for organizations that are already at, or near compliance, and those that are still ramping their compliance efforts. - A deep dive into how your data security program can facilitate GDPR compliance and the various solutions available to support organizational readiness efforts. Imperva is a leading provider of cyber security solutions that protect business-critical data and applications in the cloud and on-premises.